We are into Manufacturing and Exporting high quality UV Curing Machine. These Tabletop UV Curing machines are very popular in Labs, for small run jobs or for testing purpose of UV Inks or Varnish. These machines are used for UV coating, paper coating, paper, board, plastic sheet, metal glass, any type of plane sheets, etc. 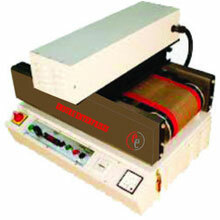 we are providing premium quality UV Curing System. This system is manufactured using premium quality raw material, latest machines and technology. Offered system is highly demanded in the market as this is examined on set industry standards to eradicate all the flaws.